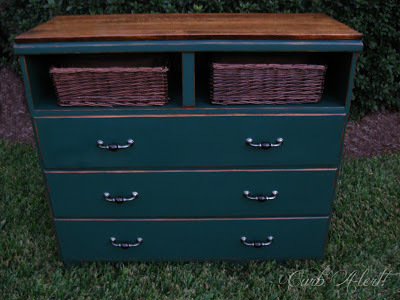 Thank you so much for the sweet comments about the Spartan Green Media Cabinet that I painted for my friend. If you remember correctly, I purchased baskets to go in the top shelf of the cabinet. 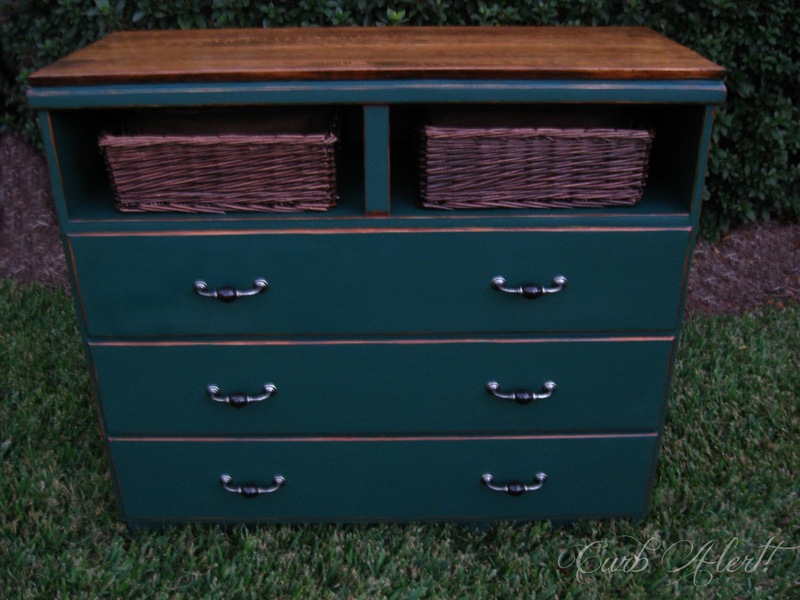 What does that leave?…an extra drawer! I didn’t have the heart to throw it away so I pryed the front off of the drawer and painted and stained the edges just like I did on the dresser/cabinet. 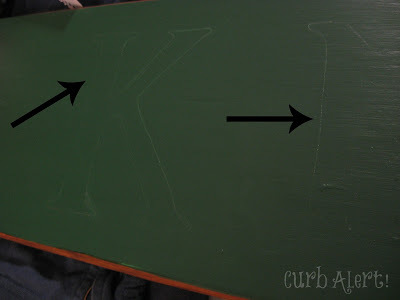 I made it into a family sign with a few quick simple steps. Painted the surface. Well, duh! That’s a given but decided to give you a heads up on that one. Do you need to see a picture of that? Didn’t think so! I measured and traced out the letters that I wanted to use on thin notebook paper. You can also print the letters on your computer with your favorite font but in this case I hand drew them. I went this route mainly because MyLove was hogging our computer at the time and I didn’t feel like waiting. 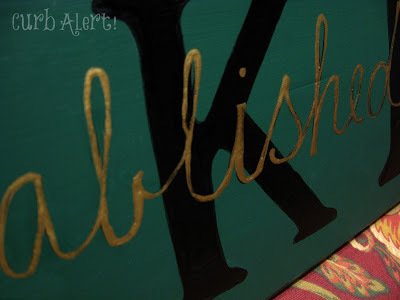 I also like how it isn’t exactly perfect, and more like it was hand painted. If you are lucky enough to own a Cricut or Silhouette vinyl machine I recommend that too…I am not so lucky but I love to draw so no problem. Lay your papers out on the board and trace over the letters carefully so that it will leave a slight impression on the wood. 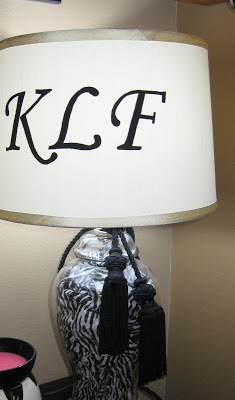 I also used this same technique on Butterfly’s lampshade but placed the paper behind the shade to trace out the letters. 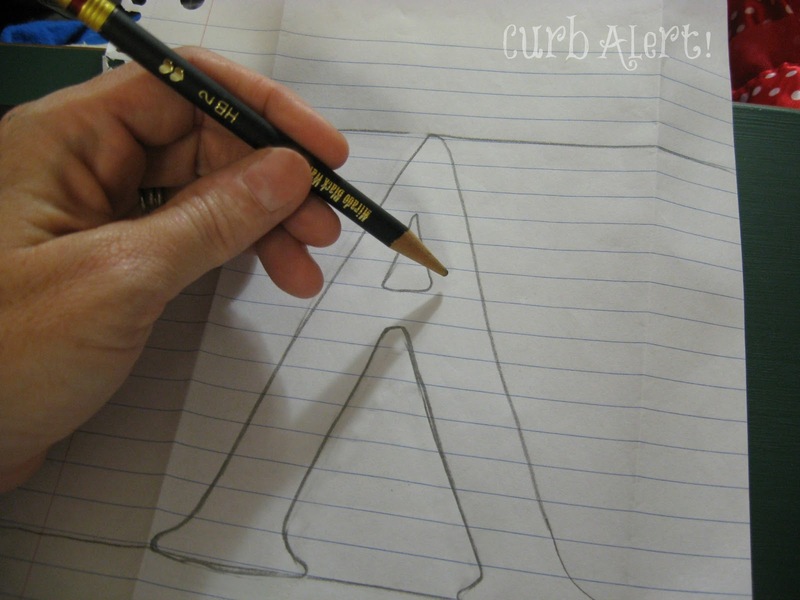 Use a Sharpie or any brand permanent marker to color in the lines. Very simple, it goes on smooth like paint. 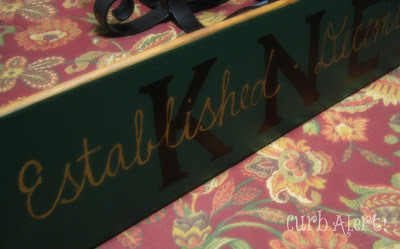 I embellished the sign with the family name and date in script with a gold paint pen. I like the added touch. …looks like I need to go over it a bit more to finish up! but I got anxious and wanted to show you guys first! I think it will look great above the new Spartan Green Media Cabinet! Next Article Christmas Shopping Anyone??? Oh this is a great quick Tutorial and just in time…I was pondering how to letter a sign I'm making! Thank you! Perfect! Thank you so much for sharing this. Now I know what to do. Yay! The lampshade is gorgeous too! 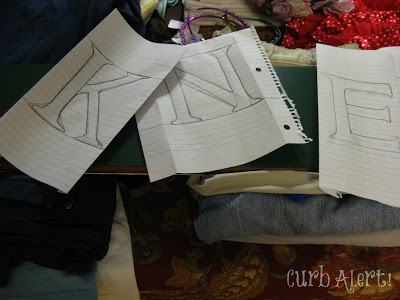 What a great tips here, I having a hard time on creating a sign letter coz I do not have the skill of lettering but on this method no I can make a perfect letter sign.